Hullo, everyone. I hope all goes well with you. Today we are tackling found poetry. I have a working definition. I have articles. I have examples. There will be links. It will be long, even for me. It will be messy. It will sprawl. But, somewhere in the offerings, I hope you find a form of found poetry you enjoy. 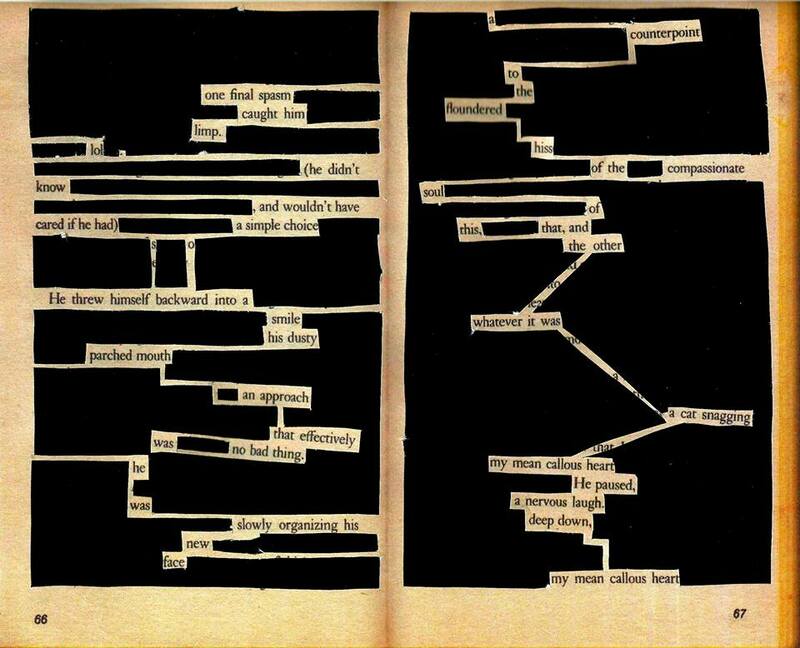 Found poems take existing texts and refashion them, reorder them, and present them as poems. The literary equivalent of a collage, found poetry is often made from newspaper articles, street signs, graffiti, speeches, letters, or even other poems. A pure found poem consists exclusively of outside texts: the words of the poem remain as they were found, with few additions or omissions. Decisions of form, such as where to break a line, are left to the poet. That about covers it. When I was first taught found poetry I learned, first, the pure form, but I was also taught how to take my finding further, to shift the poem from other to mine. At that point words are added. The poem can be so transformed as to no longer be recognised as from another source. Two of my earliest posts lay out the lesson as I learned it. Feel free to head there and give that a try. There are, now, many ways of creating a poem from found words. One of the best sources, for both reading poems — the first three volumes, as the last two are in hard copy and for sale, therefore — and finding prompts, is the Found Poetry Review. A one stop shop, you can also submit poetry for their future volumes. The FPR is where I learned about remixing, taking an author’s words and creating a completely new piece with new intent. No added words. The closest place for examples, is the tab above, My Pulitzer Remix Poems. This may be one of my absolute favourite forms to work in. I love creating poetry that is completely new, but having to use someone else’s words. To create the remixed poems, I worked through the novel, collecting phrases. As they began to fall into categories, I grouped them. As I became more familiar, I saw the direction I wanted to take and thirty poems were born. You do not need to read a novel. You can remix from an article, a short story, a blog post… but there is something about a novel that is… satisfying. Take a book’s Table of Contents and remix it to create a poem. That is fun. Find a copy of The Columbia Granger’s Index to Poetry — which contains the first line of every published poem — pick a letter and pull your lines from there. One of my favourite poems comes from Granger’s the letter I. I photocopied the entry of all first lines of poetry that begin with I and went through, blacking out what I didn’t want, recopied the lines I did like and began to create the poem, removing lines that didn’t work, as I went along. Many of you have written centos. Those are found poems. For those who have not had the pleasure of writing a cento, I am giving you a link to Wikipedia, as they have a cento with its sources next to their lines, so that you can see how it works. You do not have to feel constrained by the fact the lines belong to others. I found it no problem to write a cento in the cascade form. You will be surprised how much fun it is to write a cento, quite addictive. For a source, take yourself to an online collection of poems, find your first line, then the second, the third… remember to write your source for each line. The usual form is to list the sources after the poem; they are sometimes longer. I learned a ton from other remixers. Previously, I had not tried erasures, or blackouts, or dog-ears. The remixers even invented a couple of forms. One took an envelope, the kind bills come in, with a one and a half by four inch window. She would move the self-imposed window around her source text until she liked the words she saw, and would remix the words in that bound area. I wrote my first erasure and my first blackout during the remix weeks. The difference is in how the resulting poem looks and feels. One removes the unwanted words, the other blacks them out. Both take an eye. There are also cutouts — not to be confused with cutups — new school blackouts and a lot more complicated in their construction. My fellow remixer james w. moore is a master of the form. I am unable to show you an example because a book of his work will be published this fall. He has kindly allowed me to include what he calls ‘a simple choice’. Click on the picture to get a readable image. This is merely a cut out, nothing fancy. I can promise you that the cutouts going into the book take the form to a whole new plane. I like cutouts because I find them easier to read. A place to play: Wave Books has created a resource for creating erasures. They provide text and the electronic means of erasing. Give it a try. Should the link take you to a page that says not here, click on The Wave at the top of the page; on the page you are taken to, find the erasure link at the bottom (I know). Dog-ears. Well, they are interesting and poet Erica Baum has published a book of them, so they are an accepted form. You have to really like it. Can you tell from my tone, I don’t much? I offer this because, you may, in which case, yay! 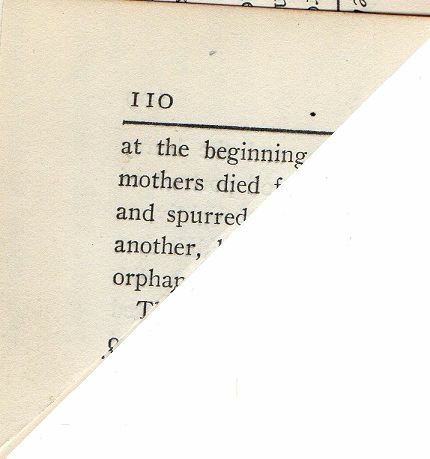 The form consists of dog-eared corners of paperback books, then photographed. When we were discussing this form during the remix days, Winston Plowes offered, as an example, the corner of page 110 in Willa Cather’s novel One of Ours. It’s the only one I like. Most dog-ears use both corners and, for me, that doesn’t work as well. The first few lines of the Google link will give you some idea. I promised an article. I have the first chapter of what looks to be a book worth having, if you find found poetry to your liking. The author, John Bevis, has cleverly allowed a free download of a chapter of A Primer of Found Poetry, a book which can be bought and downloaded on-line. Just the one chapter provides a lot of information. I shall leave you with a piece of visual art that is also a found poem. Mary Bast collages more than words. Go look at her work. Enough? I was going to sub-title but that made the post so long that I decided to let you wander. I expect all kinds of found poetry from you.